Authored by Michel Anders (varkenvarken) on Aug 14 2015, 8:01 PM. "Love" token, awarded by Eranekao. "Love" token, awarded by lordodin. "Like" token, awarded by bubblebobble. "Love" token, awarded by PrimeNine. "Love" token, awarded by SynaGl0w. "Love" token, awarded by monio. "Love" token, awarded by bliblubli. Michel Anders (varkenvarken) retitled this revision from to Expand Voronoi node functionality in Cycles. Michel Anders (varkenvarken) updated this object. Julian Eisel (Severin) added reviewers: Sergey Sharybin (sergey), Thomas Dinges (dingto). Julian Eisel (Severin) set the repository for this revision to rB Blender. Julian Eisel (Severin) added a project: Cycles. In general, I am a bit hesitant to extend our procedural textures this at this point, I rather see the CUDA kernel split happen first or at least have some CUDA runtime compilation, to compile more optimal code. Cycles Texture Nodes are pretty understandable atm, and we only have Color and Fac outputs. Adding a "F2" output seems confusing? I don't really want to duplicate Blender Internals options mess. Capital S in "Squared", general rule in Blenders UI. @Thomas Dinges (dingto): I have no opinion on the kernel split issue because it is difficult for me to have any idea of the impact on individual node code, but I agree that on the second point that we wouldn't want to have the profusion of options that BI has. However, for most people (at least in my neighbourhood :-) F2 is perfectly logical when dealing with Voronoi textures and it would in fact be more logical to rename the Fac output to F1 but I think that would break existing noodles that use the current voronoi node, right? I don't know how to add another patch to an existing patch task, but if someone is interested I have made it available on dropbox. Instead of creating a new node or new output for a node is it worth considering a new input/option for the node? That is having an input/option that selects between f1, f2 or f2-f1 ? Michel Anders (varkenvarken) edited edge metadata. Michel Anders (varkenvarken) removed rB Blender as the repository for this revision. It now adds a Voronoi Crackle nore with output sockets that match the other Cycles pattern nodes (i.e. just Color and Fac). As I mentioned before this patch contains the GPU, CPU and CPU+OSL version of the node. The .osl code is rather lengthy because the loops for each metric are written out to prevent doing string compares 27x per sample. 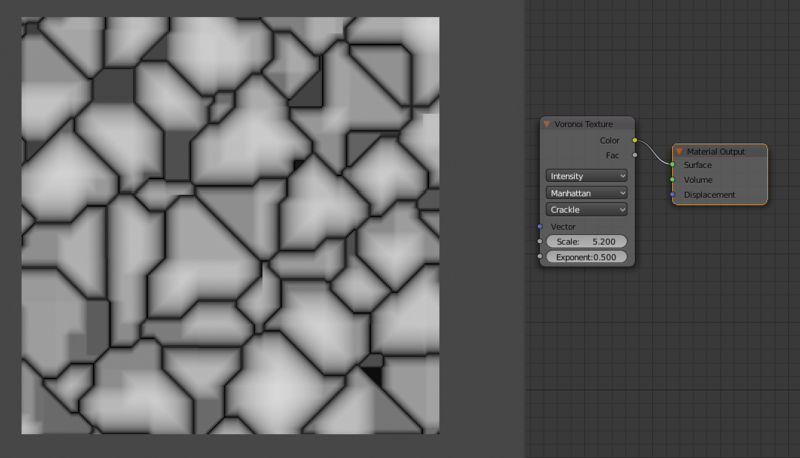 Could you use a function pointer in node_voronoi_crackle_texture.osl to avoid repeating the loops? Or are function pointers frowned on? I think the suggestion by SynaGl0w ( http://blenderartists.org/forum/showthread.php?378351-Extending-the-Voronoi-texture-node-in-Cycles&p=2922699&viewfull=1#post2922699 ) makes sense. If extending the current Voronoi node along these lines would be acceptable I would be happy to spend the time. Just let me know. The node would work for GPU, CPU and CPU + OSL. We can't really extent built-in textures infinitely, this is something what we've got OSL for. If new voronoi texture is indeed giving better artistic control for users we should consider replacing an existing node. Sergey, please understand that this patch is not niche-extra-feature but bringing back BASIC feature present in most packages/renderers. I have been intensively learning procedural texturing since about 3 years, this include scripting and non-shader based approaches like Substance Designer. Those voronoi options are biggest shortcoming in Cycles procedurals and I can assure you this is not only my whim but opinion common for many artists. Just ask them! Thats odd we have things like "Magic" texture, which is practically useless for texture building, but we can't use Voronoi F2 which is one of most common and useful procedural. Nobody told to modelers that Inset feature won't be implemented as standard tool because we have Python API for that. There is no exaggeration, voronoi patterns are really that popular. Probably 1000 more because of universality of Voronoi patterns in real world. I understand that You may not see how those options can be useful but We - material creators, quite large group of Blender users - do. Some of us waited for this for years. Please, don't kill this opportunity. If the texture is implemented in a way which isn't introducing issues into all GPUs then i'm fine having the addition, but even then please refer to the second part of my original comment (which ok, isn't so much verbosely explained). We already have Voronoi texture node which support F1 color cells and intensity outputs. To me it makes more sense to extend that node with F2F1 intensity/coloring (with some nice friendly name). ok guys, i see some agreement starting here ;-) I'll start on a new patch that will extend the current voronoi node without breaking existing stuff . I'll do my best to make it run on cpu, cpu+osl and gpu (nvidia + amd) and then submit it for a thorough review. Michel Anders (varkenvarken) set the repository for this revision to rB Blender. performance: The code is slightly more complex, mainly because it has to differentiate between different metrics and had to shuffle more neighbor values around. The initial penalty for the existing functionality was about 20% or so for GPU and CPU (less for OSL). I did some trivial optimizations, reducing the penalty to about 10% or so (on my system, YMMV). Additional optimizations might be possible but would complicate code (see also next point) so additional efforts before a review would be wasteful I think, although especially the OSL version might benefit from some additional love. code bloat: Because we have (in the svm code) already an SSE and a non-SSE version there is a fair amount of code duplication already, which is one of the reason not to spend to much time on optimizations. A large part of the difference between the SSE and non-SSE code could be hidden by wrapping large parts of the code in #define'd macros but I not a fan of that as it makes code harder to read. Only did some initial glance over the patch. Am i right you only tested you particular GPU? If so, that's not the way to test GPU support, you at least have to compile all the kernels. And still, 32bit CUDA kernels are already broken. Those are to be repaired first and then re-verified with the patch applied. Also, seems you didn't check OpenCL kernels? This shouldn't be needed, all the string-based comparisons are being unfolded at compile time. It is guaranteed to be CPU here, meaning distance can become a functor, avoiding switch statement for each of the iterations. What exactly this output is and can it be named in more consistent to other nodes way? @Sergey Sharybin (sergey): I reconfigured CMake to generate the .cubin files (instead of generating them the first time the GPU was selected) and verified that a number of kernels was generated : sm_20, sm_21, sm_30, sm_35 and sm_50, both the plain and the one marked as experimental. (a GTX970 supports sm_52 as well but I didn't upgrade the cuda driver on my Ubuntu system so I had to exclude sm_52 from the make files). The make succeeded cleanly. I now also reran the compiled Blender with 'export CYCLES_OPENCL_TEST=ALL'. It compiled without problem and the output (when I selected the OPENCL device in the user preferences) looks fine. I don't understand your remark about 32bit cuda kernels. Is that something I can help with? Or do you mean they have to be fixed and then later my patch should be verified against them? re: node_voronoi_texture.osl, string comparison unrolling, : you might be right, but i did measure a (very small) performance difference. I'll double check and like I said, especially the OSL version might benefit from some additional attention (for example, unlike the GPU/CPU variants it does optimize for less than 4 neighbor situations). re: node_shader_tex_voronoi.c, name of output : I think you mean the "E" socket, which is an input socket. It's the Minkovski exponent for the generalized Minkovski metric. I could rename it to 'Minkovski Exponent' (like in the BI texture node). The issue with 32bit CUDA is that current kernel can not be compiled for all shading compute models with 32bit bitness. Don't think there's much help needed here, just need to find some workarounds to reduce registers pressure in there. As for OSL -- i'd rather see this solved in the OSL itself. It's somewhat a whole point of OSL about optimizing huge shader networks without manually obscuring the code. Squared distance is different from actual distance by just intensity/contrast. Is Manhattan really so commonly used by artists? I'd really suggest finding a minimal basis common for majority of artists and don't expose all weird and wonderful settings to a built-in nodes. And for those who really need exact formulas to work we can eventually provide more comprehensive OSL nodes as a part of default template library. Bubble Bobble (bubblebobble) added a subscriber: Bubble Bobble (bubblebobble). I understand that You may not see how those options can be useful but We - material creators, quite large group of Blender users - do. Some of us waited for this for years. Please, don't kill this opportunity. I happen to be the author of the tutorial mentioned here, and to backup what has been said, it is certainly very exciting to have this voronoi cracks style at an artists fingertips. I also presented another tutorial at the conference https://www.youtube.com/watch?v=3vlyT3UNmFs which shows that introducing 'tiling' options for the noise and cracks would be awesome too. To produce this in cycles nodes quickly hits the SVM stack space limit and then you lose the complexity really needed for many believable texture surfaces. I realise OSL can get around some of these limitations but then you lose the speed of the GPU (plus a bit confusing for artists to create). I agree with @Michel Anders (varkenvarken), @Bartosz Moniewski (monio) and @Aidy Burrows (annex2nothing) that F2-F1 voronoi is a very useful node to have, and in fact an oft-requested functionality. To give some reference, when looking at Substance Designers implementation of this type of noise, they call it "One of the most versatile and advanced noises in the library". The operative word here is versatile. To give some perspective on how often it could be used, I'd like to include a short list of forum posts where people are jumping through metaphorical hoops to create cracks in cycles. Something which feels like it should be easy, and with the modified Voronoi node, will be. To add some personal experience: I ended up on this page because I was trying to create realistic looking tectonic plates. A process which at some point requires having a mask of where the plate boundaries are, using a gradient going from black in the center of the plate to white at the edge. With the current Voronoi noise, this is really hard to pull off. Bartosz gave a list of examples of materials that could be created using this node. That was without the recently added true displacement. Now imagine what could be made with this Voronoi node and the true displacement combined. I think not implementing this is a large missed opportunity. I hope this comment didn't sound too pushing or demanding, I just would love to see this implemented in the official Blender release, as I think it is an important feature to have for material creation. I know it has been nearly three years since the last comment on this topic, but in the meantime a solution hasn't been found, so I'm hoping i can blow some new life into it. This would be a boon for Cycles. Voronoi support is a very powerful concept, just look at Cinema 4D and how it has taken off once Voronoi support got added! I would even to offer help with coding some of this or whatever is necessary, if there is still life and interest in this project. I am hoping that Cycles team members can comment on what is holding these changes back, so we can know how to proceed and make progress for possible 2.8 or later integration. Charlie Jolly (charlie) mentioned this in T55607: Cycles: Add more procedural noise types.